If you feel that web search should be and could be faster, SoLucky may be your choice and savior, but we are here to talk about the downsides because all the glitters is not necessarily gold. This browser extension only works in Google Chrome and claims that it helps you “navigate the Internet faster.” In all fairness, we must admit that this little application does make your web search a different kind of experience where you do not need to wait for third-party advertisements and sponsored content to load in the Google search results page. Instead, you are offered the first result loaded right away. Well, as we have said, this is only the bright side of this app. But there are a few reasons why we have categorized it as a potentially unwanted program, or PUP. 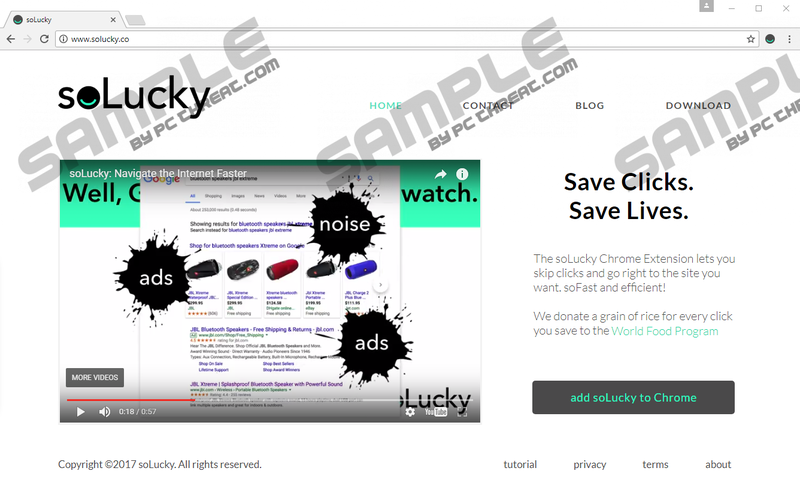 Let us tell you in more detail why and how you should remove SoLucky from your browser if you want to be on the safe side. There are two possible ways for you to install this PUP officially. First, you may find its promotional webpage at solucky.co, which is a rather simple site. When you click on any of the download buttons or links, you are redirected to the second option, which is the Chrome web store itself at chrome.google.com/webstore/detail/solucky/hjoklbpknpobbafbckcopemdnlgiclbk. It seems that only 685 users have installed it so far but it was only released two weeks ago. Before you install such an extension, it is always important for you to read carefully the pop-up window that comes up at the top because it informs you about the rights you are about to give your tool. This PUP, for example, can read and change all your data on the websites you visit as well as change your privacy-related settings. If you think that it is a good idea to give permission to such activities, well, it is up to you. We do believe that users should be more cautious with these. After the installation, you are redirected to solucky.co/tutorial where you can see a quick tutorial how you can make the best of this tool. We know that this is not yet enough for you to want to delete SoLucky from your computer, so let us go on. Unfortunately, it is possible that you might also find this PUP as many of its peers spreading in freeware bundles. If you download such a software package from suspicious file-sharing sites, such as torrent and freeware pages, there is a good chance that you will find a couple of other PUPs and even malware infections in it. The problem is that most inexperienced users do not check the full content of such a bundle. This is why you can end up with such PUPs, adware programs, browser hijackers, fake alerts, and more in one single go. We advise you to stay away from suspicious websites that host questionable third-party ads and to always use official pages to download software and updates from. If you may have visited such pages or downloaded a software package lately, we recommend that you delete SoLucky and run a full system scan with a reliable malware scanner to identify all other potential threats. The problem is that there is no guarantee that all the third parties can be trusted. So, what if cyber criminals get hold of the collected information and can send corrupt content to your screen based on your preferences in order to trick you into clicking. You might get redirected to malicious websites or download malicious programs without your knowledge. Since these are possible scenarios, we suggest that you remove SoLucky from your browser. You can easily eliminate this potential threat source from your Google Chrome browser through the menu. Please follow our instructions below if you want to do this yourself. Do not be surprised to get redirected after the uninstallation to “surveymonkey.com/r/7TD2JF5.” Since it is possible that there are real threats on your computer in the form of malware infections, we recommend that you defend your virtual security by installing a trustworthy malware removal application, such as SpyHunter. Choose More tools and then, select Extensions. Locate the unwanted extension in the list and click on the trash icon. Press Remove in the pop-up. Quick & tested solution for SoLucky removal.